I would not wish that on any one. And Set at 6:52pm DST, dark by 8:09pm. Making plenty of time for a balmy tropical evening and diner out on the street for all. Which is why Daylight Saving in winter may have been raised in the first instance by the Qld Times? I prefer the option of just leaving the clocks alone. When you try to satisfy one group you risk upsetting another. One more reason why Daylight Saving is against us rather than for us. I used to work with a woman who had a long commute to work, by train from the upper Blue Mountains to Sydney CBD. During winter she left home in the cold and dark and got home the same. Working in a closed airconed office she never saw the sun 5 days a week for about 4 months a year. Did she take vitamin D pills? Never asked. She used to want the latitude adjusted to avoid short winter days. Now if you want to go for a single time zone all you would need is some longitudes adjusted. ScoMo should promise it for the election. I mean if you can change something as fundamental as time why not? I don’t like DLS these days and the age old argument about more light of an evening is crappy too. We have seasons and the length of daylight changes all year round. Why fight it? It isn’t WW2 and we don’t need the extra light of an evening to save energy or for factories to run longer. My curtains are fine. I don’t have chickens. But I hated DLS with a passion when our child was an infant. Try telling a toddler it’s bedtime by the clock when the sun is up and we aren’t in the land of the Midnight Sun! When Qld had the first daylight saving trial in the early 1970’s, Cairns locals used to go to the drive-in movie theatre where the original screen faced west. When the movies commenced at 7:30 “pretend time”, the sun shining from over the mountains from the west effectively made watching the screen impossible. And as it was still daylight, some other activities were also interrupted. But as it is still a free country, DS supporters are still free to flee over the border. Speaking of lands of the midnight sun - those of us in Tassie are 3/4 of the way there. I am a DS hater. In southern Tassie in the height off summer it is getting light at 0330 (ADT) and isn’t dark until almost 2200 (ADT). I have had solemn heated discussions with those who love DS for the extra daylight in the evenings to engage on their outdoor pursuits. For pity’s sake - just how much daylight do you need??? Even without DS, it would be light until almost 2100 - getting dangerously close to my bedtime! In terms of business, I lived in WA for a number of years (and I too remember the trials) working for a national company with the head office in the ‘Eastern States’ which made doing business quite a tricky thing taking the time difference into account. I still work for that company but now from the ‘Eastern States’ and it is still tricky. Surely having WA on DST and the rest of us not would make good business sense reducing the time difference to one hour??? Here in Queensland we have had two referendums on this subject, in the 70s and in the 90s and people rejected it and for a good reason, we simply do not need it. I gets light around 4am in early Summer and people tend to get up early anyway so if it is so hard for business to adjust (which is puzzling when the USA has multiple time zones and no one winges about it , Well, if the poor little darlings find it hard to adjust between Queensland and the rest of the East coast well all they have to do is open and close their shops an hour earlier. If we are to have daylight saving it makes moire sense to have it in Winter as we have less daylight to play around with. In summer in Tasmania it is light till nearly 10 PM some friends tell me so why do they need to put the clocks forward? I agree totally. The problem is not in the having or the not having DS but in the some have some don’t have! It is surely enough that we have to remember different time zones without additional clock changing! Hurrah, DST is over in Melbourne! This morning I woke up without the help of my alarm clock, from my window I could see a tinge of red in the sky towards East: it was already dawn, but only 6:00am. My weather App ( still on DS) said sunrise would be at 7:39 am today!. Did not have to run against the clock for the rest of the morning. I’d very much prefer not to have DS and certainly would not wish it on any of the other States. Thank god it is over…we eat late, we wash (yes we still wash) the dishes at some ungodly hour and I do not start performing untill 11 am. I think daylight saving is for early risers… but do they use the extra daylght saving in the evening? The only possible benefit of daylight saving is that beer o’clock is an hour earlier. 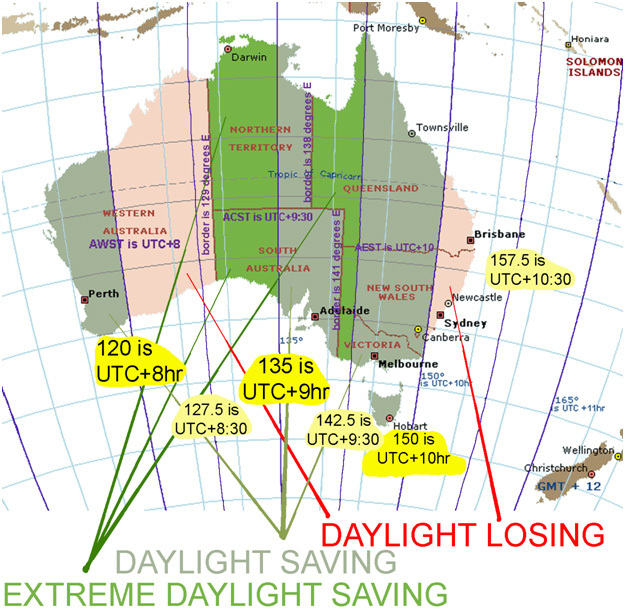 Due to the meridians chosen for the three main time zones in Australia (AEST, ACST, and AWST) considerable parts of Austraia suffer from “daylight losing” when their clocks are set to “standard time” - see the two large pink parts in the attached map. I am not going to comment on the pink part of WA, but I am going to comment on the pink part that covers eastern Qld and eastern NSW affected by Australian Easern Standard Time (AEST). The pink parts of Qld and NSW are east of the 150 degree meridian; they contain significant numbers of people and businesses. A. For the same place daylight hours during summer are longer than daylight hours during winter. B. During summer a place that is further south will have longer daylight hours than a place that is further north. For example on the summer solstice day (approx 21 December each year) a place on the Antarctic Circle has 24 hours of daylight in a day; Melbourne has 14 hours 47 minutes of daylight; Brisbane has 13 hours 52 minutes of daylight; Longreach has 13 hours 34 minutes of daylight; and Cairns has 13 hours 8 minutes of daylight. C. All places along the same imaginary north-south line (meridian of longitude) will get sunrise at the same instant as the earth rotates. Ditto they will get solar noon ( when sun is at maximum height for that day) at the same instant as every other place on the same north-south line, ditto they will get sunset at the same instant as every other place on the same north-south line. D. If you are east of the meridian used to define your clock time you are experiencing daylight losing ; if you are west of the meridian used to define your clock time you are already experiencing daylight saving . The most easterly part of mainland Australia lies on the 153 degree 38 minutes 27 seconds meridian line. ==> Currently the pink part of Qld suffers from “daylight losing” all year round - by this I mean that when solar noon occurs in the pink locations it always happens before “noon on the clock set to AEST”. The time difference can be as great as 16 minutes. Suggested solution Change the meridian used to determine AEST. Instead of using the 150 degree East meridian which is equivalent to UTC+10:00 hours, use the 157.5 degree meridian which is UTC+10:30 hours, and then use this AEST all year round. Some may say “but no body has a time zone set to a half hour from UTC” - which is incorrect. There are already time zones set to half hour differences for Australia and other places in the world (ACST is set to a half hour, ACWST is set to a quarter hour). Some may say “but what about the western parts of the states which use AEST?” Look at the map and examine the bright green areas in the west of Qld, NSW and Vic - these areas already have what I term “extreme daylight saving” with their clocks set to AEST and they have few if any gripes about clock time. Towns with gripes about AEST have chosen to set their clocks to ACST instead, for example Broken Hill. Changing AEST from UTC+10:00 to UTC+10:30 will not impact them adversely. Changing AEST from UTC+10:00 to UTC+10:30 will have a positive effect on the pink and the light olive green parts of the four eastern states. Standard time for clocks on Lord Howe Island is already UTC+10:30 hours (the island is part of NSW). Consider a place located at latitude 29 degrees south and longitude 153.55083 degrees east - this is what a clock set to UTC+10:00 says at sunrise and sunset for two indicative days - winter solstice sunrise 06:39 and sunset 16:56 (4:56pm), summer solstice sunrise 04:44 and sunset 18:44 (6:44pm). I can’t believe I’m the only supporter of DLS on this discussion. Here in Adelaide I never hear anyone complaining about DLS, and we’ve had it for a really long time. No-one complained when DLS was extended to fit with the Sydney dates when we had the Olympics there. Everyone just gets on with adjusting to the time change as we did this morning, and will again in 6 months’ time. I LOVE DLS, and it’s one reason I could never live in Qld. I want my daylight in the evening, not at 4am. See most of what you’ve said doesn’t actually explain what you like about daylight savings, it just explains why it’s not as bad as we all think. My question is why have the extra daylight in summer when it’s already light much later? It doesn’t make sense to me to have it in the summer. If it was about having extra daylight, why not have it in the winter when it gets dark early??? Instead I remember in the WA trial I always had to go to bed when it was still very light, which messed with my sleep. C. All places along the same imaginary north-south line (meridian of longitude) will get sunrise at the same instant as the earth rotates. @vombatis, love the logic and graphic. Did you consider the tilt of the earths axis? Warning, science content follows. Read on at risk of confusion. The earth is not round, but a bit squat. As the earths surface is curved no 2D map (projection) can exactly match the curved surface. The earths axis is tilted big time. The earth does not rotate 360 degrees in one day (24hours). The assumption in ‘C’ might only be correct on two days of the year around the dates of the spring and autumn equinox. It may assist to have two more example graphics, one for each equinox to illustrate the effects. In mid winter the tilt of the earths axis approx 23.5 degrees aligns roughly with the east coast of Qld. Which is why the sun in Winter in Bris is up at 6:37am, 58 minutes before Melbourne. In mid summer the tilt of the earths axis is approx 23.5 degrees the other way and roughly aligns with the SE coast of NSW. Which is why in summer sunrise in Brisbane and Melbourne are only 5 minutes different. Noted in summer the sun sets a whole hour earlier in Brisbane. As you point out in ‘A’ the further south you are the longer the day in summer. The situation reverses in winter with Brisbane having an hour more sunlight than Melbourne. Sunrise in the north EG Cairns is 51 minutes later than Brisbane, and in Cairns the day 44mins shorter. Compared to the far south of Australia Cairns is short up to 2 hours day light in summer! The current 150 degrees east line of longitude as the basis for AEST time is a compromise. Greater Brisbane might swing either way with DS? In summer the rest of the state lags Brisbane by more than an hour in daylight terms. It was probably the key factor in DS being rejected in Qld twice previously. I doubt Daylight Saving is a friend. It’s complex with diverse view points and competing needs. Note edits made to correct grammar only. Yes I considered the tilt of the earth’s axis. It is the tilt that causes different length of daylight on summer solstice and on winter solstice and all the days in between. => the solar noon is occurring on average quarter of an hour before the clock hand reach noon. To see what going north or south on the same meridian line does, consider Haddon Corner and Cameron Corner as they are both on meridian 141 degrees east. Haddon Corner is further north than Cameron Corner (26 degrees south versus 29 degrees south) and has shorter length of daylight in the summer (13 hours 46 minutes versus 14 hours on the summer solstice). The two corners have the same sunrise and sunset and solar noon times on the equinox days; and the same solar noon times on solstice days (12:43 on UTC+10 clock at summer solstice, 12:29 on UTC+10 clock at winter solstice) and all the days in between; but the sunrise and sunset times do vary at the solstices (Haddon Corner sunrise is seven minutes later than Cameron Corner at summar solstice, and seven minutes earlier than Cameron Corner at winter solstice). I would happily have DLS all year so it’s light later in winter too. But I’m an owl, not a lark as many on this thread seem to be. But I’m an owl, not a lark as many on this thread seem to be. It’s reassuring to have your input. I lived and worked for nearly a decade in NSW with daylight saving. And in other interesting places that observed the practice. I have also seen one round when it was trialed in Queensland. My observations from these years vary. Depending on my work, where I lived and lifestyle commitments, it was sometimes great, sometimes not. At one stage I seem to recollect that the evening news bulletins were put back an hour including the ABC. Does daylight saving serve to unite us or divide us might be another take on this topic? That is a little different from a debate on the merits or otherwise of daylight saving, or the broader question of time zones. Which is where some of this discussion has ventured. If you appreciate or understand that the hours of sunlight are very different across Australia? It depends where you live. If you accept each of us has different lifestyle, choices, family and work needs? And that climate varies dramatically depending on the region in which you live. If you consider and accept that there will always be a number of different time zones across the nation? It may be easier to accept why some of us are able to and choose to take great advantage of daylight saving, and why others would find disadavantage in making the change. Many in daylight saving states may just be going with the flow and not mind one way or another. Are the states that do not follow daylight saving at a disadvantage? I suspect not otherwise, as I suggested earlier all of Australia would be on a single time zone for purely economic rational, and collectively choose the option of daylight saving. Staying on the merits of daylight saving, when it was introduced the stronger argument ‘for’ was that it would be a saving on electricity usage. In fact, except for a short time in peak summer, we need to turn on the lights in the morning, in Melbourne, often people are starting out to work before sunrise, when sunrise is ‘officially’ at 7:00am or later. A stoic attitude is all very well, but some people feel tired because the shifting of the clock makes for a long evening into the night. When the clock shows 10:00 pm ( and the temperature still in the high 30s) your body clock knows it’s only 9:00 pm and struggles to find sleep. There’s a natural, lengthening of the day during summer, and beautiful long evenings: why temper with it? This seems to explain why Sydney, Canberra and Melbourne (hence NSW and Vic) are all in their own time zone in summer as they are all on a similar diurnal alignment. Most of Queensland is geographically aligned closer to SA/Adelaide time (solar noon) in mid summer based on the same onservations, only with shorter days. Apologies to leaving Tasmania out, although I hear the sun hardly sets in summer down there.